Driven by a flood of recent scientific evidence, neuroscience technology, consumer demand, and new user interface (UI) technologies, meditation is taking on a whole new existence. It is becoming smarter, faster, more powerful and easier to practice anywhere. Mental wellness is a major goal and concern for much of the population most likely due to the often times chaotic world in which we live. Having time to hit the pause button and relax is becoming less of a novelty and much more of a necessity. We also know the negative implications of stress. It is not only bad for our health but for many other important factors such as relationships and overall quality of life. On the bright side a solution exists to combat stress and mental strife and that is meditation. Much of the scientific evidence pointing to the important benefits of meditation can be attributed to the effect it has on the brain and this is studied in depth in the field known as neuroscience. Some of the advancements in neuroscience helping to drive mental wellness are the technologies found in adding brainwave entrainment, solfeggio, binaural beats and isochronic tones. These sound enhancements are being combined with amazing new user interface technologies such as smartphone apps, artificial intelligence (AI), biosensor wearables and virtual reality (VR) to create some super-powerful results driven meditation programs. Some of the latest technologies for meditation can also adjust to your unique brain state and stress levels with algorithm based functionality that enhances your progress. The latest technological advancements in the art of mindfulness meditation are designed to go anywhere, fit active modern lifestyles and the bonus is that in many ways they are more effective than a traditional sitting cross-legged in nature approach. So if the traditional approach is not your style or you would very rarely be able to practice that way, not to worry, you can still meditate. The latest apps, wearable technologies and listening experiences for meditation leave you with no excuses. Because let’s face it we all need to meditate now more than ever. 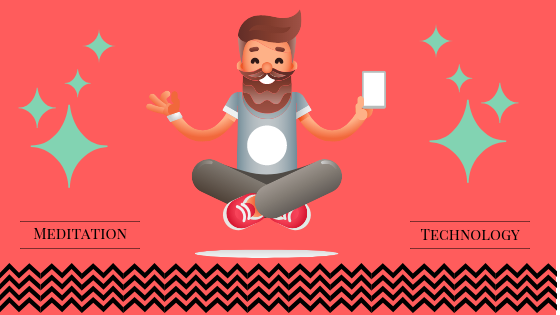 Here are some of the latest meditation technologies for practice in the modern era. A biosensor is a wearable device that translates biological output into electrical signals. These signals can be tracked and integrated with digitally-based programs that use the data accumulated to constantly adjust to your ever-changing mental status. Through the use of biosensors the following meditation apps provide you with individualized meditation sessions and feedback to personalize and enhance user experience. The Spire mindfulness and activity tracker is, according to the company, the world’s first wearable device to track breathing patterns. 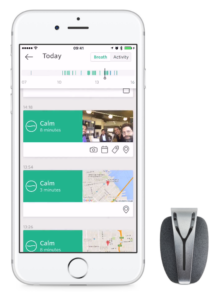 It includes a biosensor and a smartphone application to help you find your calm and very quickly if necessary by tracking your mood and stress levels. The data gathered from the biosensors is used to give status readouts through the app. Depending on your current status, suggestions are given that may include a custom meditation or breathing exercise to help you calm down and manage stress. Data is continuously collected to improve future effectiveness and track progress which can lead to better self-awareness, improved attention span, better mental focus and calmer brainwaves. 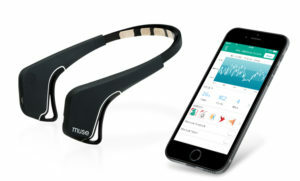 Muse meditation headband is a brain sensing wearable and smartphone application. This meditation aid helps the meditator be more certain about what their practice is accomplishing by offering real time data feedback on changing brain states in meditation. Other valuable feedback includes graphs given after every session to enhance benefits and effectiveness. 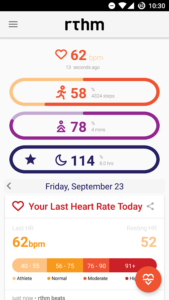 Rthm offers a biometric sensor and DNA based mindfulness meditation segment as part of their total wellness solution. The mind is known to produce brainwaves such as alpha, beta, theta, delta and gamma. Some of the latest technologies in meditation use listening meditations to induce these various brainwaves for maximum results. By directing the brain to produce certain waves you can actually train it to be healthier and more resilient. Not only is this style of meditation pleasurable but also great for relaxation and mood stability. 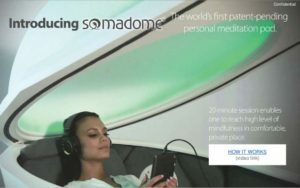 Somadome meditation pod is a personal high tech wellness sanctuary that adds colors and light to meditation which are ancient techniques associated with healing. 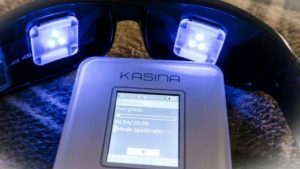 This system transforms harmful EMF frequencies that we are exposed to everyday from computers, cell phones, televisions and radio signals and transmutes them with color, light, and sound using binaural beats. MindPlace offers biofeedback, light and sound devices for optimizing your state of mind. Special high frequency signals allow precise synchronization between audio and visual stimulation. The light part of the experience allows your mind to explore interesting and transformative spaces. While the sound part utilizes binaural beats and isochronic tones to lead your mind toward many beneficial structured ranges of mind states. Brain.fm offers app-based music composed by artificial intelligence (AI) that helps to unlock music’s potential to influence cognitive states. You simply select what your goal is whether it be relaxation, meditation, better focus or a nap and the app provides music to help induce your goal. This program is designed for noticeable results within 15 minutes or less. 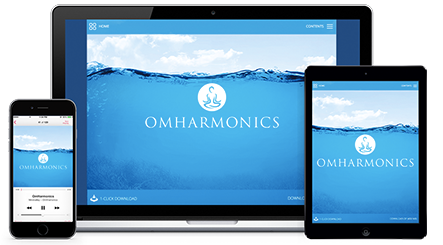 OmHarmonics from Mind Valley is a next-generation binaural beats meditation audio technology that lets you experience all the benefits of deep meditation in a matter of minutes. They offer a free course on how to begin mastering meditation that was created out of the need for a modern day alternative to traditional meditation audios. Many meditation programs of the past have typically required larger time commitments and this has been viewed as a major deterrent to practicing regularly. Recent medical studies, however, have shown that meditating even for 5 minutes per day has significantly more benefits than not practicing at all. The following apps were created to allow busy people the time to meditate. 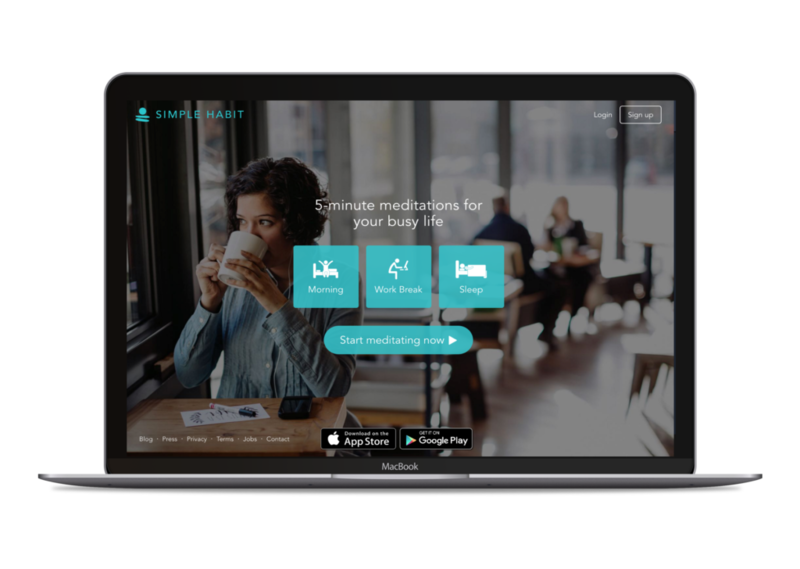 Simple Habit meditation app is according to the company “on a mission to help people stress less”. This system was developed by a group of Harvard psychologists and meditation experts. 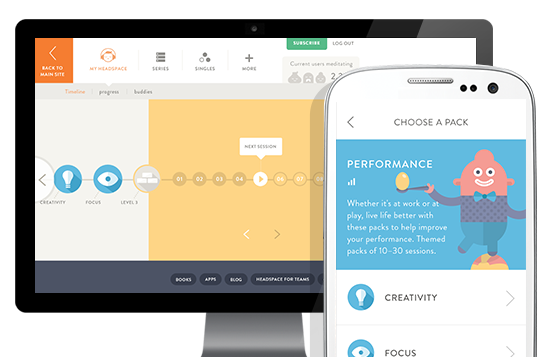 They offer 5 minute personalized meditations for everyone no matter what their skill level. It can be used for a wide range of specific instances such as ‘had a bad day’ and even ‘PMS’. This platform is constantly updated with new sessions to experience so meditation content stays as fresh as possible. Headspace is a full meditation solution online with smartphone application that’s like having a personal mindfulness meditation trainer in your pocket. With this meditation technology you can learn the basics first and get more advanced as time goes on. Their suggested use is just 10 minutes per day. Their app is free to download and they offer a free trial program. 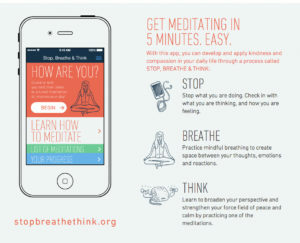 Stop, Breathe and Think wants to help you apply kindness and compassion in your daily life with their mindfulness process which seeks to bring a person out of the reactionary ‘flight or fight’ mode and back into a focused and relaxed state of being. Their guided meditations are tailored to your emotions and suggested to be used especially when feeling stressed, annoyed or otherwise agitated. 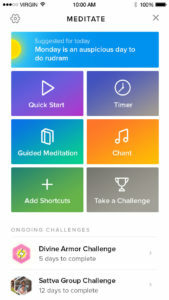 Sattva meditation app and mood tracker with free guided meditations, timer and achievement trophies offers a growing list of meditations and sounds. They believe that you can’t improve what you don’t track and hope to help you discover the best version of yourself by inspiring you to meditate regularly. If there was ever something that lends itself well to virtual reality technology (VR) it would have to be meditation. Not that there aren’t many other very useful ways to apply VR technology to different industries but VR seems like such a natural fit for meditation. With virtual reality you can actually go to the places in your mind that you try to create through traditional meditation methods. That is not to say that traditional meditation practice doesn’t have its merits. In fact some aspects of meditation will never be able to be replaced by technology such as many contemplative techniques. Sometimes, however, the result is what we are after and in some ways being able to jump into and immerse yourself in a calm serene meditative environment by strapping on a VR headset makes it easier to do so. Here are some of the latest contributions made to the world of VR meditation. 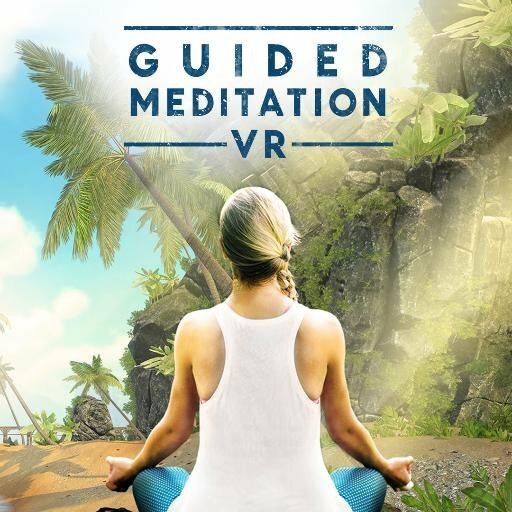 Guided Meditation VR believes you deserve a brain vacation by offering virtual reality meditations in many lush environments that were built to refresh the mind. With their program you can meditate at your own pace anywhere in the world you choose. So you can find a perfect environment to relax in without ever leaving your home or office. 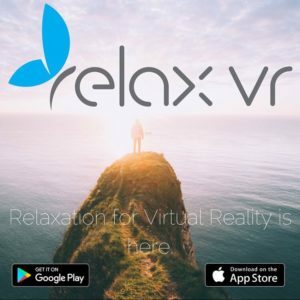 RelaxVR offers rest, relaxation and meditation with this VR application that was developed by experts in the fields of meditation and VR psychology. Their sessions are based on the yoga nidra meditation technique which is one of the most popular and effective techniques for providing physical, mental and emotional relaxation. Imagine if you could relax on a beautiful sandy beach, listening to a gentle guided meditation from wherever you may be. In this day and age we are usually in a time crunch and they say when you don’t have time to meditate is the best time to meditate. Not everyone can live the lifestyle of a zen buddhist monk, however, so the good news is that technology is allowing meditators to get those kind of results in a fraction of the time and effort. For better or worse whatever your beliefs at the end of the day what’s more important form or results? When it comes to meditation in this stressed out day and age, results are more necessary than ever. When it comes to helping people calm down, the sooner and faster the better. 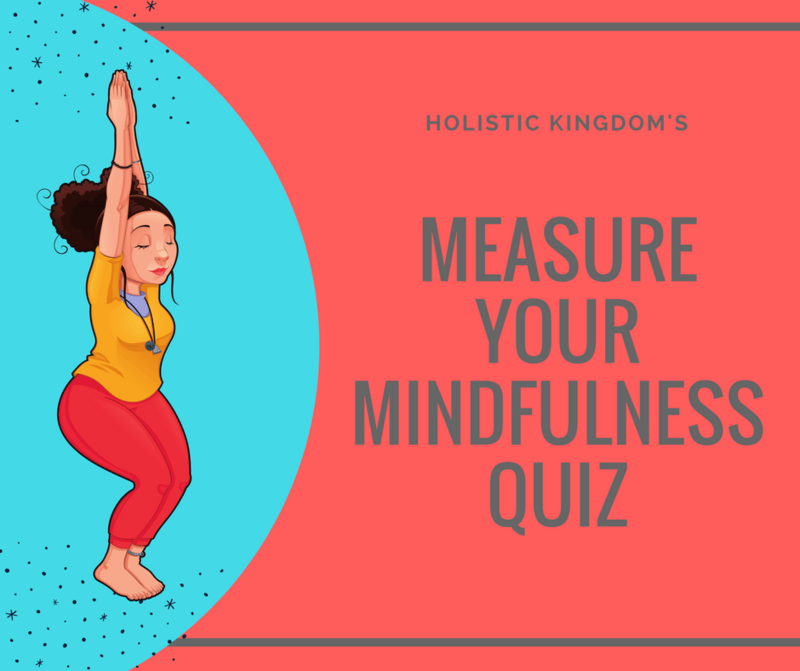 Measure Your Mindfulness…Take Our Quiz!